scrap communication: Sassafras Blog Hop!! Hi all! 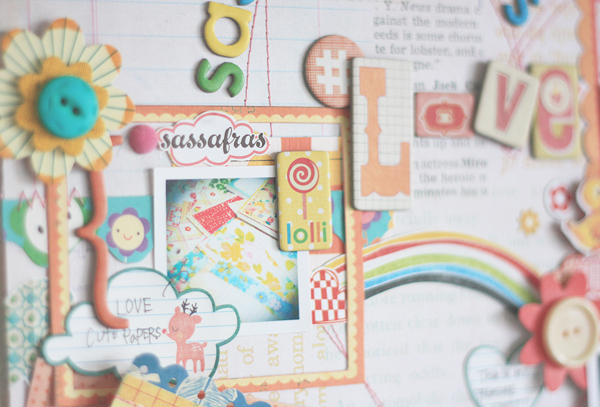 Welcome to the Sassafras Blog Hop! 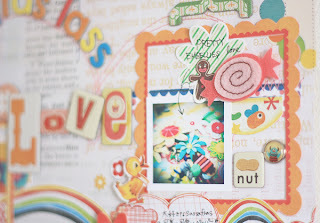 Here is my layout for the blog hop. All products I used here are Sassafras. I love Sassafras very much!! To participate in this blog hop you will visit each of the Design Team member's blogs in alphabetical order. The starting point is Anna who will send you on to the next blog. You'll find some great new Sassafras projects, and every blog has a giveaway for you to enter. (a $20 package given away at each stop!!) Giveaways close on Monday, May 9 at 9:00 p.m. EST so be sure to visit all the blogs and comment by then. The next stop is : Leïla Bentahar's Blog ! All of her work is AMAZING! Have fun!! Thank you for stopping by. Happy NSD!! Wow! so many details and fun colors. Great LO. Lots of Sassafras love. What an amazing fun page. Wow! This lo is crazy awesome! Love all the details here! Wow! Oh my gosh what a fun idea to do a page about your fave Sass! FUN! Oh my word, your layout is absolutely amazing! wowowsowowowowwow!!! So much going on there I don't where to start. This is just amazing! All of that layering is just incredible!!! wow! so much detail. such a fun page. Love the layering! Such a lovely layout! Such a whimsically fun layout! So cool, love it! Happy NSD! Holy smokes - this is gorgeous! What a great page. So pretty. OMG That is the cutest page ever!! Happy NSD! WONDERFUL! colors! Thanks for sharing! Oh wow, what a fun way to showcase favorite products. Too cute! Oh My Gosh...I'm in love with your layout!! Super FAB! Your layout is beautiful!! Love all the layering, and all the detail :) It's beautiful!!!! love the layout...the layering is awesome!!! I love all the little bits in the layout to discover. Your work is terrific! I love this page look at all that detail! Happy NSD to you in Japan! Lovely LO!! I love the amazing detail you put into the page! TFS & thanks for the opp! Happy NSD! so much detail! great page. i'm a color girl, so i'm loving all the colors, great lo! Love all the details! Just beautiful! Your layout is so detailed. Very nice! I love your work. It's always so textured and beautiful. Thanks so much for the inspiration. I'm becoming a follower of your blog. OH MY GOODNESS....!! I LOVE LOVE your layout. It's so pretty, cheerful, playful....Just GORGEOUS. Happy NSD. TFS. totally awesome! love your page . . .
super LO!! So much to see, so much fun!! fun! but i am in love w/the little tiger tail on your blog header!! Thank you for sharing your fun layout. 'Love the color!! What a fun, FUN layout! Love it! So neat, love the layout. TFS! Wow so colorful and i love all the details ! What a fun and lovely page , its amazing ! Stunning! Your attention to detail always amazes me! 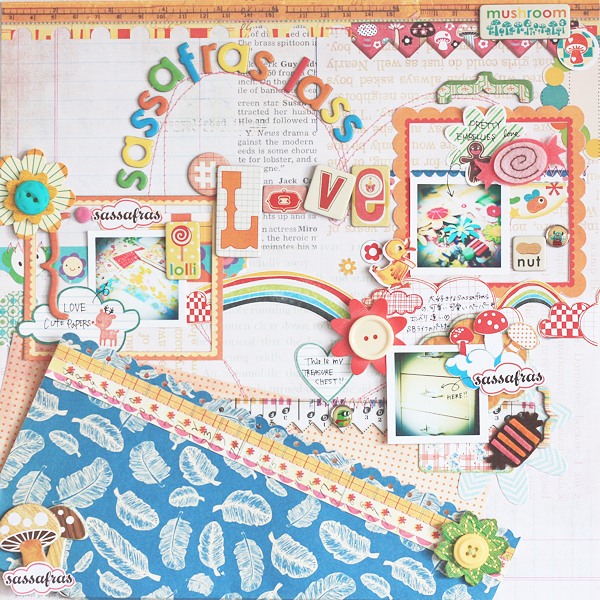 What a great layout showcasing how fabulous Sassafras Lass is! It amazes me how much detail you put into your layouts!! So stunning! Wow! Amazing. I love all the little details! What a fun way to highlight your love of Sassafras! How could anyone not love it? Awesome page layout. Love you technique. Thanks for sharing. Wow, this is just amazing! What a fabulous layout and fun technique! I love how you used so much stuff, including the packaging! Cool idea for a layout! Thanks for a chance to win! Fun page! Thanks for sharing! what a fab idea for a page! love all the details you've put on this LO. thanks for the chance to win! 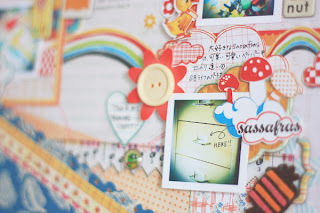 Very cute layout, love all the fun elements you added to the page! Thanks for the chance to win! That is amazing. Absolutely amazing. Your layout is so fun and cheerful! Happy NSD! Wow, look at all those layers!Thanks! WOW...lots of lively layers. Thanks for sharing ! love all the colors--sassafras rocks! Love your layout! So bright and fun! What a great idea! So much fun sass on one page!! I love all that is going on on the page! This is amazing. All I can say is WOW! I love how you combined all of the different lines! Your layout is beautiful! love love LOVE this!! So many cute and fun details. It's just perfect for this blog hop! I love all the details! Happy NSD! Whoa! This LO is amazing so many details!!!! This page is beautiful!! So nice that you did a "tribute" to Sassafras! Love every bit and piece you created on this wonderful layout! ちょう 可愛い~ ❤ love all the layers and little details you always put on your layouts. thank you so much for the chance to win. hope you had a great weekend! The way you added all the details on this page - simply amazing! Woweee! So many wonderful details. Glad to see you using some of SSF older stuff! I love SSF too! Amazing layout! There's so much going on. Love this layout. It definitely shows your love for Sass! They do have great products! Such a fun layout! Love all of the layers and details!!! Fun layout! I love all your details! Oh my! So much eye candy!! I love it! Such fun and colorful layout!! Your layouts are so fun! I just can't imagine... it would take me hours and hours to do something like that. So I'll admire yours instead! Very cool! Love your rainbow connections! There is so much to your layout, I love all your creative touches. I especially liked your title placement. What a great, fun page! 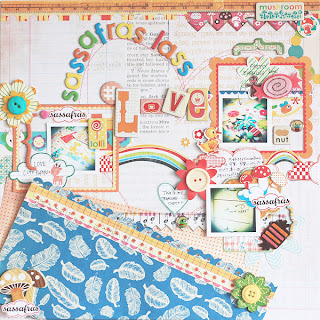 Great layout showing Sassafras love! LOVE it! what fabulous layering! lots of layering and super kawaii! What a fun layout! I love Sassafras, too!